The Aerospace Lectures are made possible through a generous gift from Caltech alumni Drs. 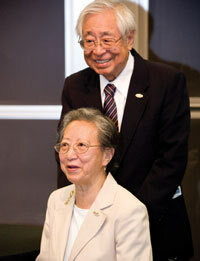 Jain-Ming (James) Wu (MS '59, PhD '65 Ae) and Ying-Chu Lin (Susan) Wu (PhD '63 Ae) who carried out their doctoral research in GALCIT. Through this lecture they honor a professor who has made significant impact in their lives. Graduate Aerospace Laboratories of the California Institute of Technology (GALCIT) alumni Jain-Ming (James) Wu (MS '59, PhD '65) and Ying-Chu Lin (Susan) Wu (PhD '63) wanted to honor professors who have made a significant impact in their lives. Their vision and generous gift to Caltech has established a new lecture series in Aerospace. The first of these lectures was given in honor of Dr. Frank E. Marble, Richard L. and Dorothy M. Hayman Professor of Mechanical Engineering and Professor of Jet Propulsion, Emeritus, a faculty member of GALCIT since 1949. This lecture featured Sébastien Candel (MS '69, PhD '72) from École Centrale Paris, France, who discussed new perspectives in combustion dynamics and control. The second lecture in the series was given in honor of Dr. Anatol Roshko, Theodore von Kármán Professor of Aeronautics, Emeritus, a faculty member of GALCIT since 1952. This lecture featured Garry Brown from Princeton University who discussed structure and vorticity in turbulent shear flow.